Look, the Green Lantern film experiment was a huge flop in all regards. OK, sure, it was the number one movie in the US the week of its release, but it didn't hit expectations and hasn't been near the top of the box office since. The toys, both the collector-oriented Movie Masters and the more kid-friendly 3 & 3/4th-inch variety have been underwhelming to say the least. The Movie Masters figures have already lost their spot at Target and the remaining figures found their way to the clearance aisle during this last aisle re-set. If you had any intention of collecting the subsequent series that are required to build the Paralax Collect-and-Connect figure, then you may want to look on-line. Sure, we are still waiting on a Hector Hammond figure, but until then, kids can reenact Hal's flashback where his dad plummets to his fiery death. 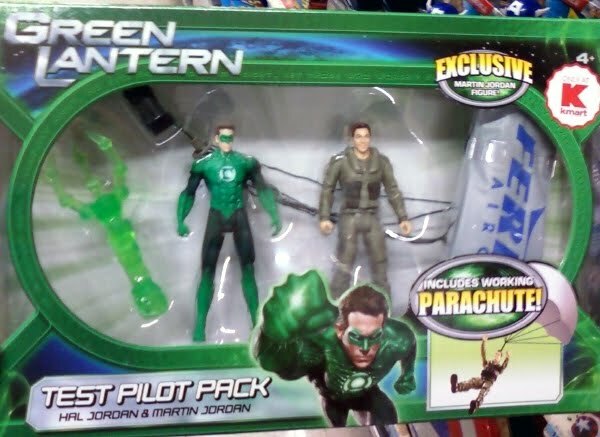 Only now, kids can change Martin Jordan's fate because this toy INCLUDES WORKING PARACHUTE! I actually thought this was a flight suit Hal Jordan at first, since that figure already exits, but the head sculpt looks nothing like Ryan Reynolds. And as soft as the sculpting has been for this line, you can still tell the figures are supposed to be Reynolds. Then I noticed the box listed the figure as Martin Jordan. The plot thickens. I flipped the box over and thankfully there was a full explanation. This is Hal's dad Martin (portrayed by Jon Tenney). Well, it's Hal's dad when Hal was a kid, because Hal's dad died in front of Hal - in a firey jet crash. But now Hal can save his dad with that claw construct. Fun for all ages!